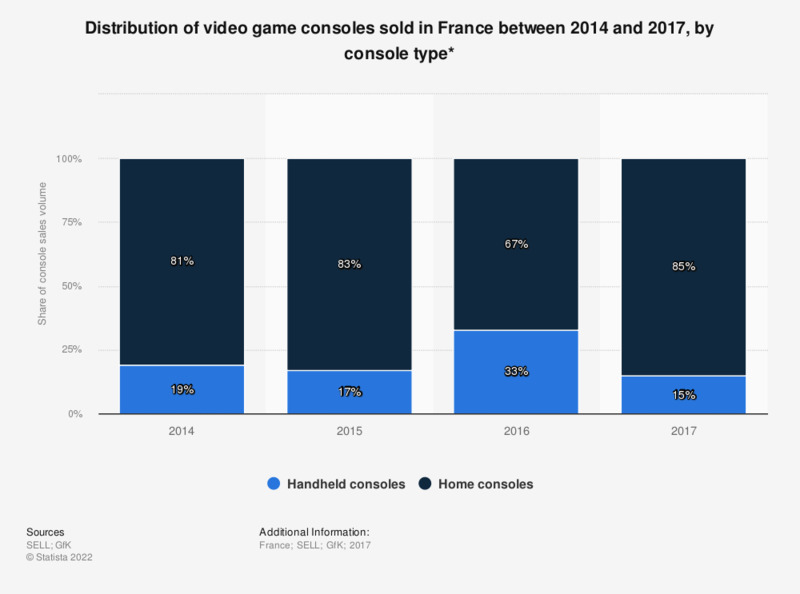 This statistic is a distribution of gaming consoles sales volume in France between 2014 and 2017, by console type. It shows that out of a hundred video game consoles sold in 2017, 85 were home consoles and 15 were handheld consoles. * Handheld consoles: Nintendo DS, Sony PSP, Nintendo 3DS, Sony PS Vita. Home consoles: Microsoft Xbox 360, Sony PlayStation 3, Nintendo Wii, Microsoft Xbox One, Sony PlayStation 4, Nintendo Wii U.